The Tunigo iPhone app is a successful Spotify client with intuitive gesture controls, strong visual presence, and fantastic interface. The free iTunes App Store download is a must-have for Spotify users. The Tunigo iPhone app opens with a handy guide to gestures. You simply swipe down to close the music player. You swipe left or right on the track information to move forward and back in the playlist. You open a sliding left menu by swiping to the left, or, not included in the introduction, you can tap the list icon in the upper left corner. You must log-in with Facebook or Spotify credentials. The process is sweet and simple, and you are greeted by a matrix of types of music with complementary, exciting graphics. The categories addressed events, moods, types of music, and more. After you tap a category like workout, kids, urban, or chill, you move to a new matrix with photo, title, and a quick description. For each playlist, the interface is concise despite the great quantity of information and tools. At the top of the screen, there is a photo and chance to subscribe to the playlist. Just below, you will find a description, number of subscribers, playtime, and date of last update. Then, there is a list of songs on the list with album photo, song name, and artist. The three dot icon next to each track opens a cool pop-up to check out an artist’s Spotify information, move straight to the album, add to your playlists, favorite, and share to Facebook, Twitter, and email. You can also choose to share the entire playlist by touching the three dot icon in upper right corner of screen. You simply tap a song for the Tunigo iPhone app to play music. The chance to skip tracks with gestures is really cool, agile, and intuitive. 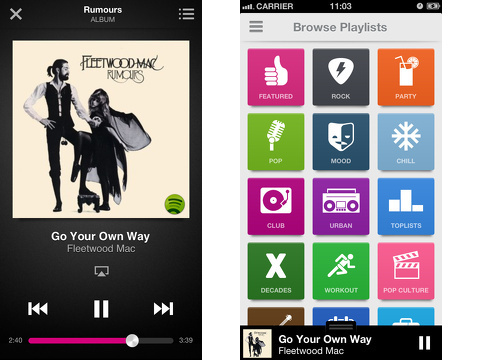 Music continues to play in the background, as you move around your iPhone’s features and Tunigo’s features. It is not unusual to run across iOS music apps that become wonky and interrupt play as you move around an app’s content. That is not the case with the Tunigo iPhone app . You can move back to different categories, check out playlists, artist information, and album information. Unless and until you tap a song, your existing music will continue. 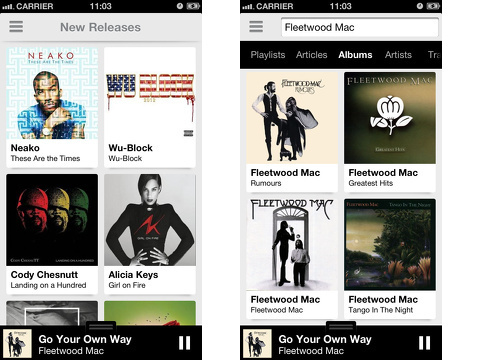 The Tunigo iPhone app is an attractive, agile, intuitive, and sophisticated Spotify client. AppSafari review of Tunigo was written by Jenni Ward on July 16th, 2013 and categorized under App Store, Free, Fun, Music. Page viewed 5571 times, 2 so far today. Need help on using these apps? Please read the Help Page.